In this book, China-Latin America relations experts Margaret Myers and Carol Wise examine the political and economic forces that have underpinned Chinese engagement in the region, as well as the ways in which these forces have shaped economic sectors and policy-making in Latin America. The contributors begin with a review of developments in cross-Pacific statecraft, including the role of private, state-level, sub-national, and extra-regional actors that have influenced China-Latin America engagement in recent years. Part two of the book examines the variety of Latin American development trajectories borne of China’s growing global presence. Contributors analyse the effects of Chinese engagement on specific economic sectors, clusters (the LAC emerging economies), and sub-regions (Central America, the Southern Cone of South America, and the Andean region). Individual case studies draw out these themes. This volume is a welcome addition to the growing body of literature on China-Latin America relations. It illuminates the complex interplay between economics and politics that has characterized China’s relations with the region as a second decade of enhanced economic engagement draws to a close. This volume is an indispensable read for students, scholars and policy makers wishing to gain new insights into the political economy of China-Latin America relations. Chapter 5: Chinese Agricultural Investment in Latin America: Less There Than Meets the Eye? 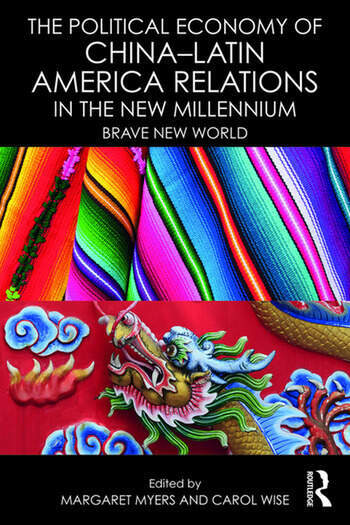 Chapter 9: Central America, China and the US: What Prospects for Development? Chapter 11: China-Brazil Economic Relations: Too Big to Fail? Margaret Myers is Program Director for China and Latin America at the Inter-American Dialogue. Carol Wise is Associate Professor of International Relations at University of Southern California. She specializes in international political economy and development, with an emphasis on Latin America.